If you wake up in the morning and look in the mirror to find alarming, dark shadows beneath your eyes, don’t stress! Dark circles under eyes can be caused by a couple common factors that you will be able to easily adjust in order to reclaim a fresh, bright appearance. Lack of sleep–Fatigue is the most common reason for dark circles to form under your eyes. The position in which you sleep might also make your eyes puffy– if you sleep on your side or stomach, your face can fold into your pillow and place pressure upon your eyes. Consider sleeping on your back or on your side with an extra pillow to elevate and protect your eyes. Alcohol, salt, or caffeine–Consumption of alcohol is a major cause for dark circles under eyes. Other products that can negatively affect your eyes are foods with high levels of sodium and caffeine, which cause your body to retain water and aggravate the skin beneath your eyes. Use of skin products–Make-up is a tempting solution for hiding the dark circles under your eyes, but skin products can actually irritate your skin further. Be cautious when cleansing your face, as harsh or excessive facial cleansing can also irritate the sensitive skin by your eyes. Aging or genetics–It’s possible that the shadowed circles are only the slight hollows that develop under your eyes as you age. Unfortunately, dark circles might also just be hereditary. If the skin near your eyes is naturally thin, the blood is more likely to show through and make it appear darker. When should I see a doctor? In very rare cases, dark circles under eyes may be a sign of a more serious condition. 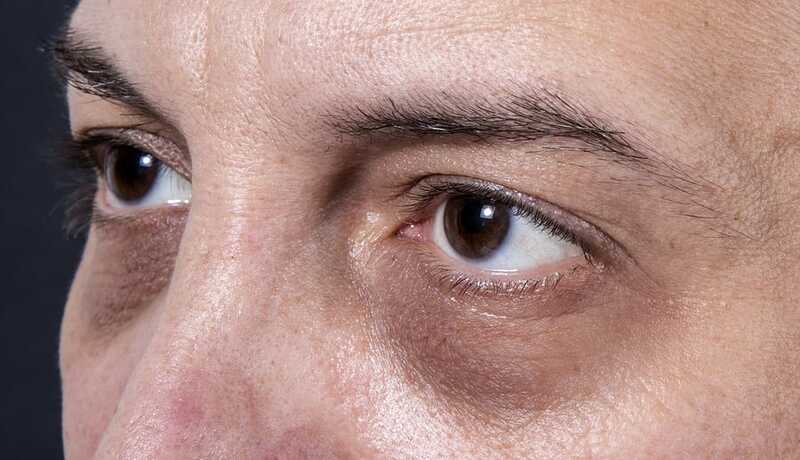 If swelling and discoloration appear only under one eye, arrive suddenly and are extremely dark, or do not go away after a few days, seek medical attention. Don’t let the dark circles under your eyes bring you down! Book your appointment with your Valley Eyecare Center optometrist. Call us at 602-955-2700 or schedule online today.